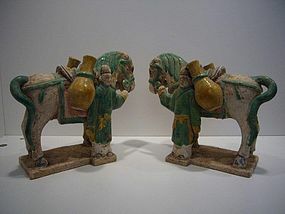 A wonderful example of Ming Dynasty (1368-1644) burial gifts, this pair of glazed and painted pottery horses and grooms. Dimensions: W. 20 cm H. 17 cm. Condition: expected age wear, no damage or repair.